Kids Rock Cancer rock star Dannah, 12, is an experienced songwriter — she participated in a KRC session once before, with her younger sister. But this session was different — this time, it was all her. 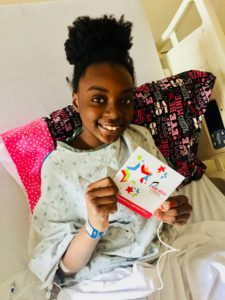 Dannah, who has sickle cell disease, spoke at length about how her support system, especially her family, has helped her along the way, by checking in on her, asking her how she is feeling and reminding her to breathe. While dealing with the challenges of sickle cell disease, a strong support system is crucial in order for kids to get through the pain. Whether it’s the hospital staff, family or friends, emotional support is so vital to getting through treatment. Throughout the songwriting process, Dannah noticed she was not just writing about her external support system, but also composing lyrics about her inner strength. She reflected on the ways she distracts herself from her pain, such as coloring, watching a movie, playing with friends or spending time with the people in her life who offer her such positive support. This entry was posted in KRC News, Music. Bookmark the permalink.